This May, we said goodbye to our 10 student scholars, and completed our inaugural year of the Global Health Equity Scholars (GHES) program. What a year! 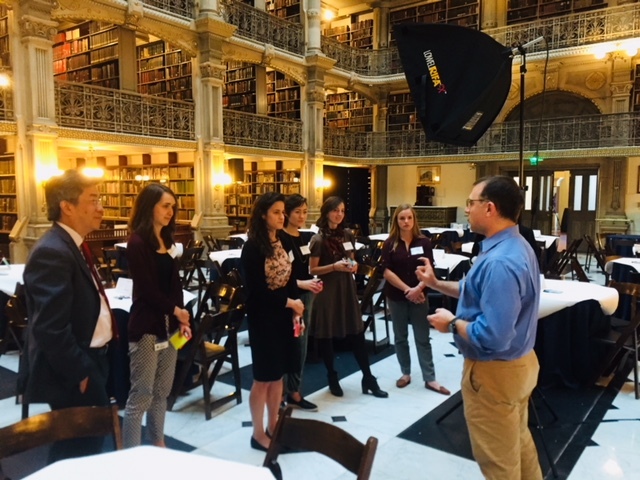 The program is designed to equip Johns Hopkins students with the skills and frameworks needed for health equity-centered research and practice careers. Through targeted research projects with faculty leaders of the four thematic priorities, regular sessions with Alliance staff and invited speakers, the scholars dove into the theory and practical applications of health equity. The initial months were spent figuring out the shape of this new program – which lectures work, which case studies resonate – but always at the core of our work was understanding and advancing equity. Scholars were paired with our four thematic leaders and staff, often with several working on different projects for the same theme. They also attended regularly monthly sessions where we unpacked what they each were doing, and the ways in which equity could be promoted. One commented that they were able to expand their networks and expertise about issues within public health. As the manager of this program, one of my key roles is to teach, but it is truly my privilege to learn from these student scholars. From one, we heard about the way she approaches the many structural and social barriers to equitable health in her clinical care here in Baltimore. Another from the business school articulated why in certain circumstances it might be more effective to pay more for higher quality services even with limited funds – which sparked a conversation on the tension between operational costs, efficiency and perceptions in resource-constrained field settings. These students stood out to us during recruitment for the range of perspectives and approaches they apply to impact health; and then they exceeded our expectations during the first year. Collectively, the 2017 scholars were affiliated with the Bloomberg School of Public Health, Carey Business School, Krieger School of Arts and Sciences, School of Medicine, Whiting School of Engineering and JHU partner, Maryland Institute College of Art. Each of them brought different knowledge and skills to the table – a must-have for bridging across fields and integrating perspectives to address health equity. Abigail Reich, Food and Nutrition Security, conducted interviews with experts to explore how faculty and staff at JHU are engaged in food security and nutrition research. Ruth Young and Kimiko Van Wickle, Healthy Environments, interviewed and analyzed data to inform the plans for a toolkit to help communities assess air pollution and take action. Amy McDonough and Rachel Pellagrino, Program Management and Communications, analyzed 50 key programs and external organizations working in the global health equity arena to better understand the type of positioning and messaging AHW would benefit from to effectively demonstrate impact, value and distinguish itself from similar organizations. You can read more about the 2017-2018 cohort here. Our scholars are off to their next adventures – some to finish degrees, some to gain hands-on field experience, and others to commence careers both domestically and abroad – and we wish them well in their future endeavors. For the 2018-2019 cohort, we’re looking to make this program even better. We’re expanding our curriculum and deepening the involvement students have with the JHU and Baltimore communities. The next cohort of scholars will embody the same multidisciplinary outlook. Most importantly, we invite students from all majors and levels to apply to our 2018-2019 scholars cohort - we want to hear from students across JHU about how equity drives them. Applications will open in mid-August 2018. Further details about the Global Health Equity Scholars Program will be shared in the Health Equity Connector next month. For questions about the program, please refer to our FAQ page. If your query is not answered here, please reach out to the Program Manager via this email.